The twist-style handset comes with a 2.5-inch, wide-view main LCD screen plus a sub-display, antenna-embedded earphone for enhanced TV reception, and 2.2-megapixel camera. The handset can only handle around 2.5 hours of continuous digital TV viewing; 1.5 hours of analog — ruling out Lord of the Rings style 3-hour viewing marathons. DoCoMo’s Osaifu-Keitai mobile wallet is part of the package as well, enabling the phone to be used as electronic money. 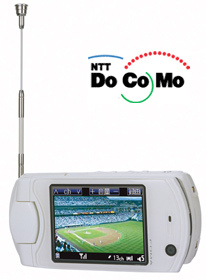 Vodafone and KDDI have had demonstration models of terrestrial digital TV receiver/handsets for some time. Last may their latest versions were up and running at the NHK Science and Technical Research Laboratories open house. Vodafone displayed the 801SH Sharp CDMA Qualcomm handset with a hybrid split-screen displaying TV images on the upper half with the bottom reserved for scrolling data feeds. KDDI showed off a similar au prototype handset by Sanyo. Check-out our video report from that event here. Though DoCoMo has released few details, similar handsets from the other carriers have incorporated AVC/H.264 video encoding protocols. Prototypes were projected to incorporate 320 horizontal lines and either 240 or 180 vertical lines at a maximum of 15 frames per second. Bit rates were expected to be in the 128- to 192-kbps range, which is rather slow and can result in picture distortion. Broadcaster NHK and Fujitsu laboratories were working on solutions to this problem. Telecom carriers have worked along with NHK Science and Research Technology Labs in the development of digital TV handsets giving the mobile digital initiative de facto government backing. The first week of October and CEATEC will show whether the P901iTV is just a lateral spin on predecessors?f Vodafone and KDDI digital TV models or a whole new ratings game. miniSD is the trademark of the SD Association.